Per suggestion by @dboi88, this will be a place to discuss development of KSPedia and wiki documentation for @RoverDude's MKS. Right now the wiki looks like it needs a complete overhaul, which is a daunting task. I think that it would be good to establish some guidelines for organizing the thing so that we can avoid a proliferation of redundant pages. 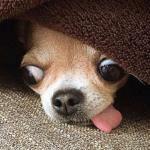 Documentation is good but "moar documentation!" is not usually a good thing as it becomes very difficult to use, let alone maintain. As GitHub wikis do not seem to support Wikipedia-style talk pages, it looks like we'll have to do this on the forums. Obviously there are other folks working on the wiki already... what do you all see as an outline of the content that we'll need? Efficiency, especially efficiency parts. Machinery requirements, load, etc. Logistics, logistics, logistics! What are the different kinds, and what are the requirements (PartModules? specific parts? crew? max range?!) to make each one work? Most importantly - what's currently implemented; mention what's been been deprecated and what's only planned. 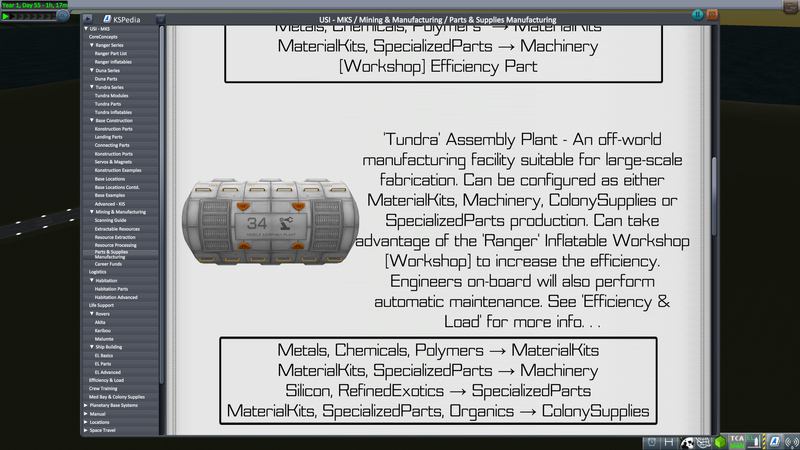 Details on each part - Ranger, Duna, and Tundra series. What converters does it have at what rates, is it an efficiency part (or does it benefit from efficiency parts), what crew is required, etc. Compatibility with other mods - KIS/KAS, EPL, Workshop, etc. @PocketBrotector Might be best we start another thread just to keep from overtaking the main release thread. I've had to balance the line between detail and too much detail quite finely with the KSPedia pages. No one's going to read pages and pages of text, but i wanted to ensure it gave as much useful info as possible on the basics. I think I've got a really good structure laid out that could be further fleshed out for an online wiki. It'd obviously make keeping both updated a lot easier if the general format remained the same. If you want to start a new thread (not sure where is best) and ping me we can discuss further. To add, great to see some more people willing to invest their time to help others. It's probably best we decide where to put everything while the new wiki is worked on, so all the changes can be discussed and kept track of. It'd be best if someone took main control over that. So it'd have to be someone willing to get everything set up and fleshed out from the XML file of all the new stuff and realistically be able to spend time on it regular for at least the next few weeks until it's all done. We'd need to pull in some of the other useful info I've not included and then fluff it out from there. Anyone willing to take charge on that front? There's a rough XML sheet here of all the text elements I've got so far. It's a bit weird, it's backwards with the first pages at the bottom. 5 - 61 Base Locations Cont. There was some mention of a Github for the wiki (as in: For in-development text and assets). I'm willing to have that in my account (and open to others for commits) if no one else wants to have it - but since I'm still stuck in KSP 1.1.3, I may not be the best choice. I've created a GitHub repo with all the images and Unity project files here for the KSPedia entry https://github.com/dboi88/USI-MKS-KSPedia for now i'm only going to be using it as a backup system but feel free to pull any images you want to use from there. I only ask you credit them. I'm going to write up a clear and correct copy of all the text from the entry into a text file on the repo once i'm done with [images], [diagrams] & [tables] noted where people can post issues and PR's for changes. FYI i'm willing to do the same thing in there for a bigger wiki that we can then update from to Roverdude's wiki. It'd be much easier to do once I've finished the KSPedia and i'd be willing to put in the time to manage it and i'd be happy to leave to others to commit changes once i'd set it up. So unless someone really wants to get going asap i could get that up and running in a week or so once the KSPedia entry is complete. @PocketBrotector I've left a comment on you're flow chart. You missed chemical's for the refined exotics process. Other than that it's great, much better than the one i'd been playing around with. Do you mind if i try and put a little workflow together to strip that into an image, resize/work as appropriate to it can easily be updated in the KSPedia entry? I'm learning how GitHub works, but shouldn't the KSPedia artifacts be in @RoverDude repository? Is it possible to include the KSPedia in his mods, or are they a separate install? If they can be included(and RD concurs), having them merged in one repository seems o make the most sense. Another bonus is that I think the KSPedia images could be used in the Wiki if they are in the same repository (I'll have to test that out tested, can paste with full URL so actually any site will work). The KSPedia work looks like it will make a fine backbone for the wiki... it would be primarily a matter of formatting for Markdown and then adding more details as desired. Like you said, it would make sense to wait until KSPedia is complete before converting it. The only other caveat I can think of is that basic life support (habitation, recyclers, and agroponics) should point to the USI-LS wiki, while MKS docs should cover the advanced life support (organics and colony supplies). Please feel free to use the flowchart however you you see fit. Once I created it, I found that the software wouldn't let me directly as an image without a paid upgrade, but it should let you create a copy in case you want to divide it into multiple sections or whatever. We could potentially fit more detail if there were separate charts dedicated to, say, basic & advanced life support & industry. RE: things to do, here's what I laid out in the Wiki: ToDo page before. By no means complete, but it shows where I was headed. The slides show where my ideas on how to present the next section of work on converters in the list below. (TBD) Finally, someone with better understanding of the dynamics can tackle the Efficiencies, multipliers, and effect different skilled Kerbals have on different parts/processes. In the meantime, a quick how-to for first base, both orbital and planetside/munside appears to be what most people are seeking. Another bonus is that I think the KSPedia images could be used in the Wiki if they are in the same repository (I'll have to test that out). I don't think RD would want to ever manage the KSPedia entry himself, it's a hell of a lot of work i think he'd drop it if it was out of date and no one was willing to step in. He will include it in his repo once complete but probably only the actual asset bundle. Yes it will be included in the official release. You should also be able to link to the images from my repo into any of the wiki's you want. Please feel free to use the flowchart however you you see fit. @notthebobo Agreed, one of the main things i think the wiki should be geared towards is really well written tutorials. 27 pages done, only 18 to go . . . I'm looking over the file but it appears all the XML tags have been stripped out, so its a bit of a struggle at this point. It looks like there's overlap in the parts sections you've created and the part sections that have already been updated in the Wiki (see "Parts: Dun Series", "Parts: Ranger Series", and "Parts" Tundra Series". They're easily lost because the old parts pages are still out there. At some point, they need to be archived/whacked. There should be an overlap for everything because i'm trying to cover everything in the KSPedia, but the way it had been categorized didn't really transfer well over to the structure you're stuck with in Unity. Basically whoever decides to get on with the work should decide their method. Whether to simply update the wiki directly as has been done already or build a whole new version to be copied over once complete. I'd like to volunteer...ping me if I can help with anything. One comment I'd like to make is that in a few places, I see that people are cutting and pasting the in game descriptions from the parts. While they tend to have a certain style, they are not always real descriptive and repeating it in other places doesn't really add value. I was thinking about trying to make a part template that will contain all reference information, like it's exact functionality, whether it needs a profession, whether if consumes, distributes, or both, etc. I was thinking about trying to make a part template that will contain all reference information, like it's exact functionality, whether it needs a profession, whether if consumes, distributes, or both, etc. I've tried to have an overview page of each 'series' of parts with basic descriptions and then different descriptions and relevant stats in each section. I also hope to put tables of hard stats in another section as well for quick reference purposes. I need someone to come up with some first though. So you could help in that area. The XML file makes much more sense, thanks. I'm fine coordinating the pages. I don't want to be a roadblock, however. II was thinking about trying to make a part template that will contain all reference information, like it's exact functionality, whether it needs a profession, whether if consumes, distributes, or both, etc. In the current Wiki, I approached it like shown below. It quotes (literal Wiki quote) the in-game description and the basics about the part (cost, mass, crew, storage abilities, etc.). What it doesn't have are the converters, life support modifiers, habitation modifiers, etc, because each of those needs a context to explain them. 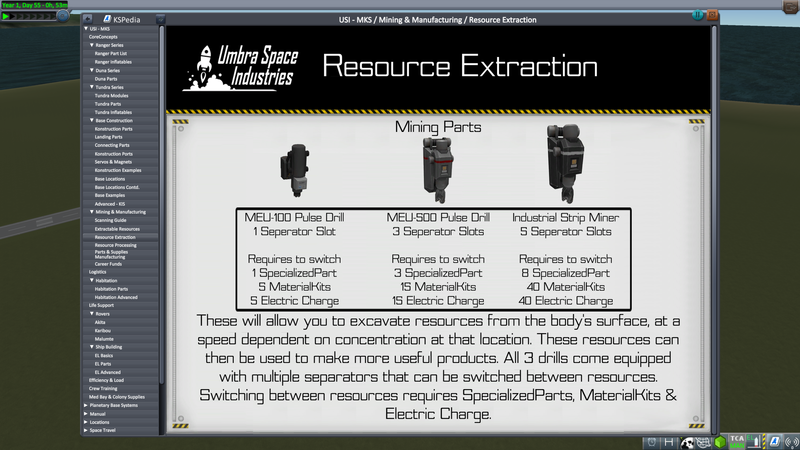 I was thinking that there would be a section on each of the USI-LS game strategy points (supplies, habitation) as well as MKS specific strategies (mining, manufacturing, recycling, EVA repairs, etc.) and having details about each module in those sections. The bottom-line question is, when people access the Wiki, are they looking for all information on a part in one place (e.g., here's what a Tundra Assembly Plant can do) or are they looking for what parts will perform a specific function (e.g, extend the habitation constraint, decrease the supply construction, allow recycling of mulch). Answering that question really affects how the wiki should be put together. The approach I get from dboi88's KSPedia structure is that sections 2,3,4, and 10 are trying to answer the part specific questions while the other sections are for describing the strategies of the game, which is a perfectly valid strategy that aligns with how the rest of the KSPedia is constructed. An expandable greenhouse that can be configured as an algae-based farm and biological filter using either recycled waste (yuck!) or local resources (either substrate or dirt, plus water). Requires fertilizer, and can be used to supplement larger greenhouse-type modules. Ensure an experienced scientist is on board for optimal efficiency. The Ranger site now links to the KSPedia pictures. Pretty! The bottom-line question is, when people access the Wiki, are they looking for all information on a part in one place (e.g., here's what a Tundra Assembly Plant can do) or are they looking for what parts will perform a specific function (e.g, extend the habitation constraint, decrease the supply construction, allow recycling of mulch). Answering that question really affects how the wiki should be put together. What does this part do now? And what are the differences between the Ranger, Duna, and Tundra variants? And what are the "hidden" requirements for full functionality - profession, efficiency parts, etc.? Oh, this produces [for example] Organics... what do those do again? Can I just see an example of something that works so I can tinker with it? Even the specific quantities involved (e.g. the ratio of MetallicOre consumed to Metals produced) might as well be included since we're going to be looking at them anyway in the course of examining the part configurations. One comment I'd like to make is that in a few places, I see that people are cutting and pasting the in game descriptions from the parts. While they tend to have a certain style, they are not always real descriptive and repeating it in other places doesn't really add value. The limitation of the in-game description is that they're designed to be evocative or funny rather than deeply informative. If the Kerbitat claims that it provides "all the comforts of home," that's very colorful but it tells me exactly nothing about how it differs in practical terms from, say, the Colonization module. the general strategy: "Build a Ranger base capable of life support before you tackle a huge Tundra base capable of off-world construction" might be the MKS equivalent of "when you're first trying to orbit, start out going a straight up and turn east very gradually..."
the particular mechanics: "here's what you need to inflate that greenhouse" is the equivalent of "here's how you need to set up RCS thrusters to get full control for docking"
the specific numbers: "this Tundra module has a better conversion rate than the Ranger module" is the equivalent of "here's why the Poodle is better than the Mainsail once you've reached space..."
Ok, I've pulled together a plan that I think will map well to the KSPedia. I've defined it as a Site Map page on the Wiki. If you decide to take one of the pages, please amend your name to the sitemap so we know someone's working it. The Kore Design page is really the main page as it covers the main topics, referring to other pages where more detail is provided. This page captures the planned/in-progress re-do of the site to align with patch 0.50 and later. One thing that's missing from that - and that I know was appreciated - is documentation for other mod developers who want to inter-operate with MKS: How to activate the various mechanics in your parts, and what is appropriate, balance-wise. It's a more technical audience, and they can always refer to the rest of the wiki for details on how things work in-game, so it can be very abbreviated, relative to the rest of the wiki. Added. Not sure who is the best POC for any modding changes. If you know someone, let them know we're looking to update. Outline looks good and I imagine it will evolve as things are fleshed out. Earlier this evening I created a Resources reference/glossary that incorporates the flowchart and provides a (deliberately terse) description of each resource's relationship to its precursors and products. I will reiterate that I'd like to see documentation of USI-LS features primarily on the USI-LS wiki rather than the MKS wiki. MKS extends and expands upon USI-LS concepts, but there are plenty of people who use life support without MKS, and they need support just as much as the MKS users. Best not to conflate the two different mods as it will confuse the folks who need help the most. Good points about the USI-LS wiki. Is anyone working on it? I wasn't aware that Fertilizer production was in USI-LS. What module does the conversion from Gypsum or Minerals? I did it for the previous version of the wiki - but it was written using a combination of RoverDude's docs and my own experimentation. RoverDude hasn't released his docs for this yet (his balance spreadsheet should be a good starting point), and I can't run the current version, so that path is likely to be blocked for the short term. Fertilizer production in USI-LS is pretty simplistic - it just adds an Ore -> Fertilizer option to one of the stock ISRU. Gypsum and Minerals are strictly MKS. One more thought... we should make a pass through the existing pages and examine whether they should be incorporated into the updates or just deleted. There are a few that are blank, explicitly outdated, or have inscrutable titles/content. Based on the broken link in my signature I think that renaming a page is as good as deleting it, anyway, since it breaks all links (GitHub it seems is not as nice as MediaWiki when it comes to redirects). Supposedly GitHub wikis are implemented as repos, so if we "delete" anything of value, it should be possible to recover it afterwards with some digging... haven't tested it though. If someone wants to tackle USI-LS, that would be helpful. As for deleteing pages, you're right that renaming them does not change the links on other pages. I've started renaming pages that I think are OBE with "ZAPPED AS OBE" so they aren't gone, but they're grouped together at the end of thee page index and "out-of-the-way". @notthebobo Good work on adding the images, they look great. I don't know if you noticed most of the parts for the 'Ranger' series are on one image, this will change at some point in the next few days as i'm going to go back and split them out. (it was an early and in vain attempt at optimization) so i'll let you know when I've done that so all the parts can have their own image. In regards to the 'Tundra' module image and module numbers will you be able to overlay one image over the other? if not let me know and i'll knock together a set of images with them already on for the wiki. The same will be done for the Duna modules shortly as well. Can we also add in a section on the Wiki for 'Konstruction' and 'Reactors' seeing as they're bundled with MKS now. The wiki editing seems really easy. I've had a play this morning and added some more pics.